Future Technology Devices International Limited (FTDI), available through Glyn High-Tech Distribution introduces the DB9-USB-RS232 range of modules designed to replace a DB9 based RS232 connector on an existing board design with a USB 2.0 connector interface. 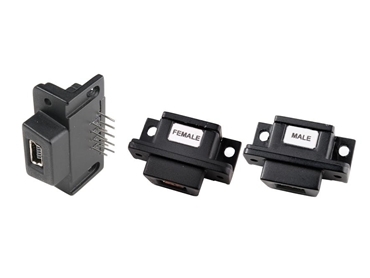 The USB 2.0 modules feature a standard USB ‘mini-B’ type connector in a module that fits the PCB footprint of a standard 9-pin DB9 connector. The modules are designed to provide a fast and simple method of replacing a DB9 RS232 interface with USB 2.0 connectivity without the need to change a legacy PCB board design. The DB9-USB-RS232 modules contain all the electronics needed to carry out the conversion between RS232 and USB. The modules utilise the popular FTDI FT232R, USB 2.0 to serial UART converter IC, which handles the USB protocol conversion. The DB9-USB-RS232 modules are supplied complete with FTDI’s royalty-free drivers, which enable a device to be integrated as an additional COM port into an existing software application. The range of drivers includes Microsoft WHQL certified drivers for Windows-based Operating Systems as well as drivers for Linux and Mac OS operating systems. All drivers are freely available for download from the FTDI website.